The typical take on American participation in the First World War - a wag might say the entrenched take - is firmly that of a supporting role. American declared war on Germany in April of 1917 but had an army of only about 150,000 and correspondingly low levels of materiel; a year was needed for the country to train and transport enough men and machinery to Europe’s Western front to make any kind of difference in the titanic slogging matches that had been happening there between the French and British forces on one side and the German and Austro-Hungarian forces on the other. By the time the American “Doughboys” were arriving on the battlefields of France in significant numbers, the standard accounts go, the gritty determination and “big pushes” of the Allied forces had largely succeeded in breaking the Central Powers. True, 117,000 Americans died in the war, but this was a tiny fraction of the millions lost by other powers like Great Britain, France, or Russia. At most, the American presence tipped already weighted scales. 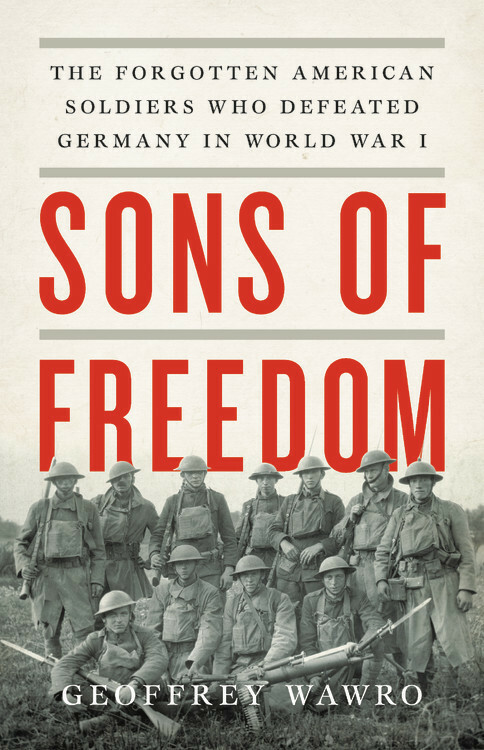 Methodically and utterly convincingly, Sons of Freedom works its way through data and evidence while disregarding national mythologies designed to validate the millions of lives Great Britain and France lost in the war. Wawro points to the fact that both British and French manpower reserves had been bled white by catastrophic battlefield losses (many incurred by poorly conceived and poorly executed military initiatives); he points to a Russia racked by revolution and on the verge of a collapse which would have allowed Germany to shuttle dozens of battle-hardened combat divisions from the Eastern front to the Western front, where Allied forces no longer had the men to match them in either numbers or resolve; he points to the mutiny that had just recently swept through large segments of the French army; and he combines these and many other factors to arrive at a very different picture of how the war stood as 1918 began. The German army, still three million strong and defending positions in France and Belgium behind the Meuse River, decided to ask for an armistice, not because it had been beaten by the British and the French - who seemed incapable of beating the Germans in 1918, or arguably ever - but because it was beaten by the Americans, who broke through the eastern bastions of the Hindenburg Line, advanced on both banks of the Meuse, and surrounded the German army in France. Sons of Freedom tells the story of a new World War I, a savagely bloody conflict that was all but lost by the Allies until American forces began pouring into the Western front, pushing back the advances of the Central Powers, forcing Germany into more and more costly counter-measures, and finally precipitating the end of the fighting. It’s an account of the war that will give even lifelong history enthusiasts whole worlds to ponder.